A Zig and A Zag | Life Is Fine! Fine As Wine! As I mentioned in my previous post, last weekend was spent in Los Angeles and included a trip to the Getty on a sunny afternoon (also known as “every day in LA“). During our visit, we took the garden tour, and perhaps I was particularly prone to drinking the Kool-Aid that day, but several of the tour stories stuck with me… including this one about the garden walk pictured above. 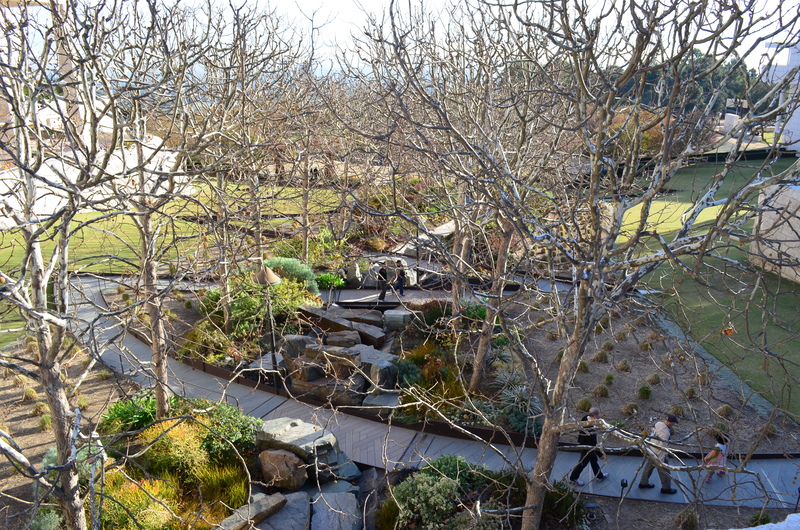 The idea behind it is like so: the artist was tasked with creating a garden walk that was accessible to everyone. The walk is set on a fairly steep incline, so a straight path would have been too treacherous for many who dared traverse it. Instead, the artist designed a transecting path that softened the blow of the hill and at the same time created something special – a unique perspective and singular experience at every turning point. (Man, I hope I did my docent right with that synopsis). I didn’t have to think long to uncover the metaphor in that. Very often I wish things were easier – I wish that life was more simple, that my direction was clear, that the secret of success was straightforward and accessible. At the same time… if you get there too fast, you done gone and missed the beauty all around you. An indirect path enables realization at every turn and forces you to slow down and take your surroundings for what they’re worth. I want very badly to trust my docent in that sacred truth, and I will myself to recall that garden walk when I sense I am lost along the way. I think that picture is absolutely amazing! I live in southern California, where exactly in Los Angeles is that!? I’m not as familiar with the area but it is in Brentwood just off the 405. Definitely worth a visit!